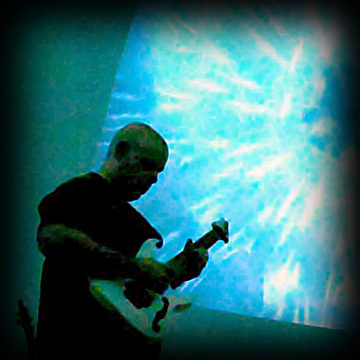 Har is an American solo ambient artist and guitarist/bassist/Chapman Stickist for the experimental art-rock band Christus and The Cosmonaughts (Beta-Lactam Ring Records recording artists). Har has also recorded with artists such as elmodic, The Wretch, Mariel and others. Har is also the host of the weekly online dark-ambient radio show "Nightscaping" on Stillstream.Com. The first albums Har ever owned as a very young child were The Sandal's instrumental surf classic "Soundtrack to 'The Endless Summer'" and Tangerine Dream's "Rubycon"...which may explain a few things about his somewhat warped taste in music. This, combined with first seeing the movie "2001: A Space Odyssey" at a very early impressionable age, was most likely the source of his life-long fascination with music and sounds that could generate vivid mental "visual" imagery whenever heard. He started playing piano with formal training at age 7, guitar and bass at 15, synths at 16, and in the past several years has added Chapman Stick to his sonic arsonal as well. Fascinated and inspired by Robert Fripp's legendary Frippertronics technique of using a single processed/looped guitar as its primary sound source, Har began to move away from keyboards/synths and instead started to experiment with using highly processed guitars, basses and Chapman Stick as the source of the sounds in his music. Doing so seemed to feel more "organic" (for want of a better word) to him - using the raw sound of fingers on strings as the core tone, instead of electronic oscillators and samples. Blessed/cursed with a photographic memory of his dreams and nightmares going all the way back to when he was a toddler, Har began to draw from this vivid, unusually complex and sometimes disturbing imagery as a source of inspiration for his music - which in turn started to focus on a more textural direction where traditional melody and structure may or may not always be relevant to the overall sonic "landscape" Har was trying to create. Around 2003 Har joined forces with synthesist/sound designer/writer/Computer Music Magazine contributor Scot Solida as the epic "post-apocalyptic psychedelic art rock" band Christus & The Cosmonaughts, and its instrumental space-rock "alter-ego", The Prayer Capsule. Signed to Beta-Lactam Ring Records, C&TC released their 2007 album "From Atop This Hill" to very positive reviews world-wide. 2007 also marked the release of Har's well-received first solo ambient album "Dream Tower Blueprints" performed entirely on software-processed guitar and Chapman Stick, and has had tracks from it played on NPR’s Star's End and Hearts of Space radio shows, as well as the 24/7 all-ambient online radio station Stillstream.Com. Though technically not an "official band member", Har also records with the very cool German synth-pop band elmodic. He played the guitar solo on the single "Shallow Man" from their excellent 2005 debut album "Unsound Fantasy", and went on to perform all of the 6- and 12-string guitar work on their powerful 2008 follow-up album "Monoism", released on the A Different Drum label. Fast forward to 2010: Har began hosting "Nightscaping", a weekly radio show on Stillstream.com (every Sunday night starting at 6:30pm Eastern / 5:30pm Central) with a focus on the more dark and mysterious corners of the ambient music universe, where he often also does live-in-the-studio improv solo performances as well as "spinning the ambient hits". Also in 2010 well-known electronic/ambient music luminary, Recording Magazine editor/writer and fellow Stillstream host Mike Metlay invited Har to take part in the 10th mindSpiral space-music concert, which took place on April 24th 2010 at The Fiske Planetarium at the Univeristy of Colorado in Boulder. Har joined Mike Metlay and synthesist Darwin Grosse to perform an elaborate meeting of space music and digitally generated visuals (provided in real-time by Dr. Trace Reddell, Associate Professor of Digital Media at The University of Denver), before both an enthusiastic live audience at The Fiske Planetarium, and to listeners world-wide during the concert's live broadcast on Stillstream.com. Har's long-awaited second solo album "Obscura" was released in June 2010. Still focusing on escewing synths for guitars and Chapman Stick (as well as the addition of 8-string bass and tabla), "Obscura" marks a shift towards mostly hardware-based processing which inspired a decidely much more dark, mysterious and sometimes ominous atmosphere. More information can be found at Har's main website, http://www.ambientguitarist.com and the Christus & The Cosmonaughts MySpace site at http://www.myspace.com/christusthecosmonaughts. © 2019 Har. All rights reserved.